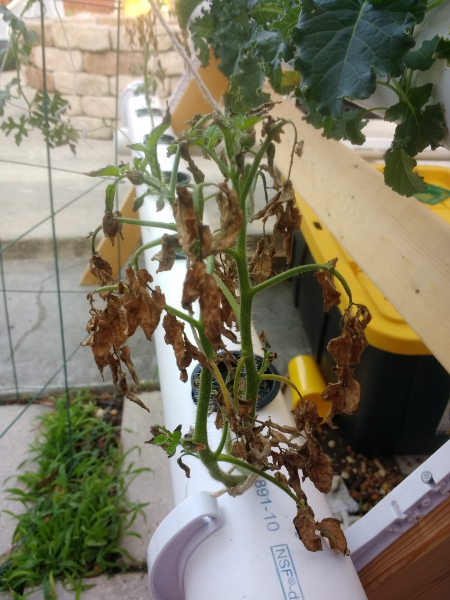 A few weeks after starting this hydroponics ordeal, I had to take a trip that meant leaving my seedlings unattended for a prolonged period of time. Because of this, I decided to move these seedlings outside ahead of schedule. To make matters more interesting, the weather forecast was windy during the day and low 30s during the night. To combat the windy days, I decided to shelter the seedlings by sandwiching them between plastic sheets. On one side, I temporarily re-purposed old soccer goal post as a roof/side cover. On the inside, I used a trash bag as a sheet to stop some of the wind form the other side. As for the temperature, I read that most grown plants could resist root temperatures into the 40s. This first batch of plants were from some left over seeds I had in the fridge from a garden years ago. These seeds were for peppers, basil, tomato and cilantro. As for the cold, I could only hope for the best as these plants were a bit small. 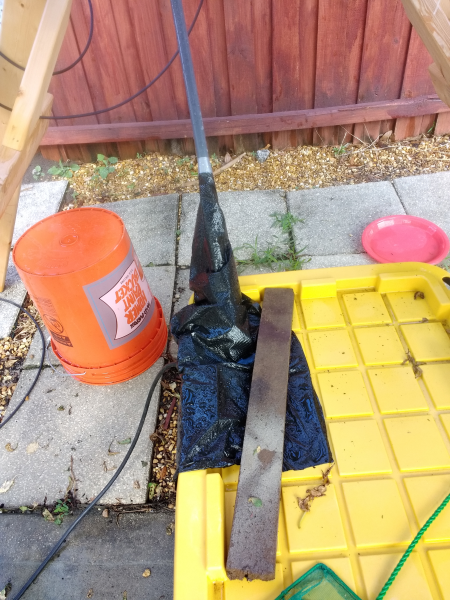 I just topped up the plastic container with as much water as would fit to mitigate the temperature fluctuations. 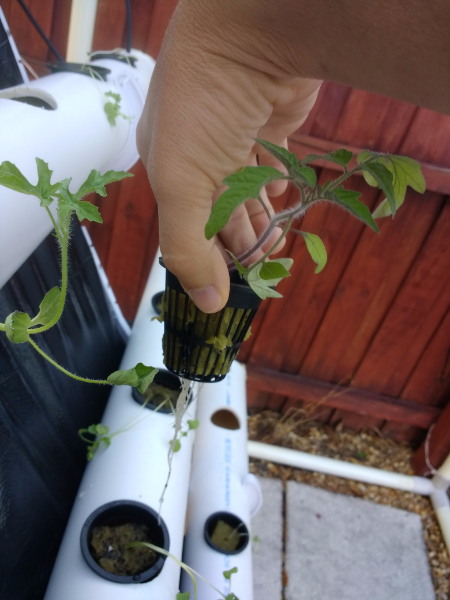 Transplanting the seedlings was both fun and rewarding. 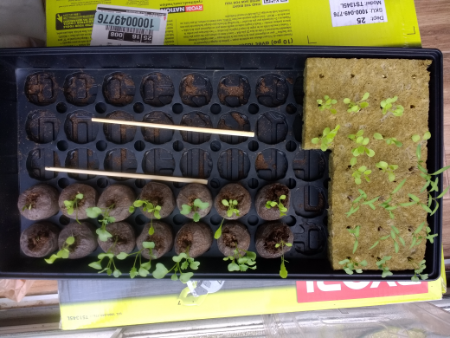 Clearly, these plants are a little small for the great outdoors but, given the situation, getting a batch of old seeds sprouting to this level is progress. This is rock-wool and little pots where the sprouts would end up in. It is better to go thru these situations and learn with these than loose fancy heirloom or some exotic seeds at a later stage. Lastly, this is all that is left after the plants were moved over to their new home. With a few weeks of experience under my belt, I decided to try kale and lettuce. 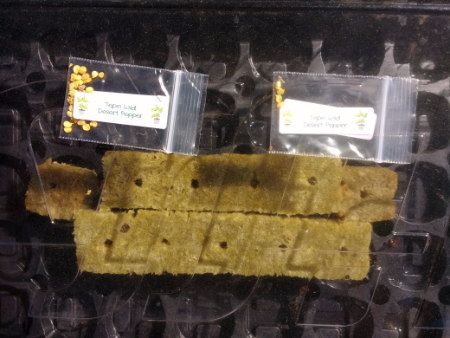 I ordered from Seed Savers Exchange. Shipping was fast and the only problem encountered was deciding what to order. They have a large variety to pick from. If you have ever had an aquarium for any extended length of time, you know very well that algae is inevitable. Another thing you know is that algae is something you manage, seldom eradicate. Shame on me for not thinking about this. Every time I saw a hydroponics system on display, the water was crystal clear. Regardless, some of my choices are the direct causes of algae in the system. I’ve decided to not go crazy because of this and just deal with it. I’ve decided to just isolate problem areas and deal with them individually. 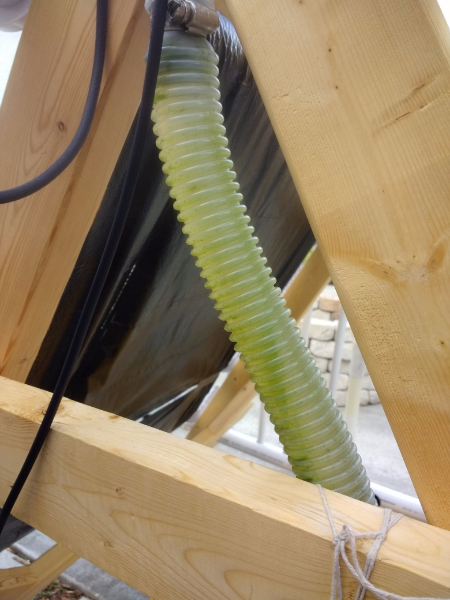 Clear tubing – Re-purposing a pool pump and hoses. 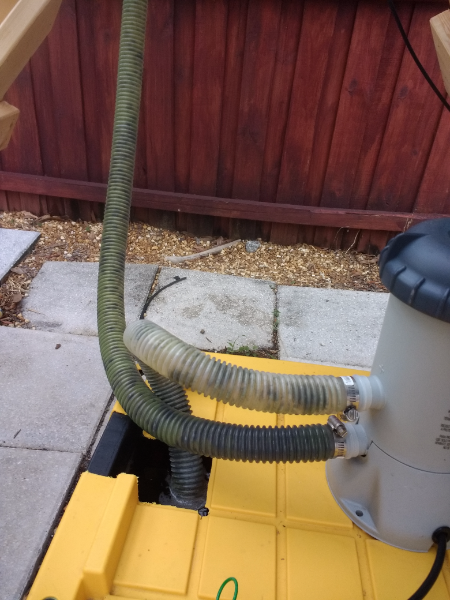 Issue number one was that the hoses that came with the pool were clear. This quickly promoted algae growth. Here is the revised setup with all the, now clean, clear hoses completely inside of the water tank. A think plastic bag covers the hole in the top. Reducing the use of these hoses and covering that being used has helped mitigate this issue somewhat. In this picture you can see that some of the holes have no plants in them. Algae lives here. 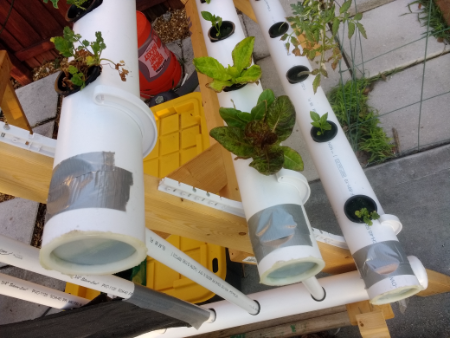 Empty pot holes – Having made 90+ holes for all plants, most of these were left empty with running water inside each PVC pipe. 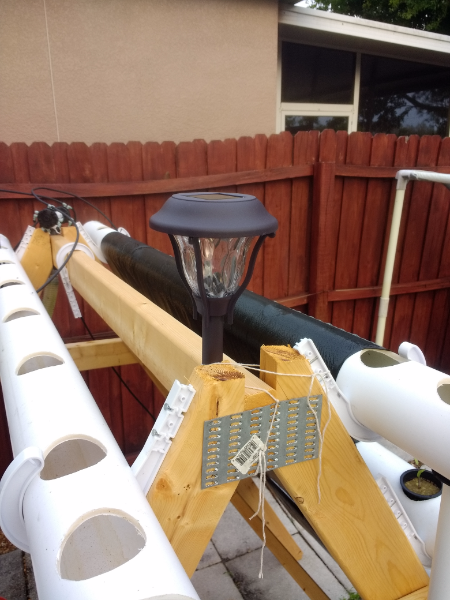 Letting all this light in also helped algae take hold of the system. Covering unused holes with duck-tape has greatly helped combat algae in the pipes. 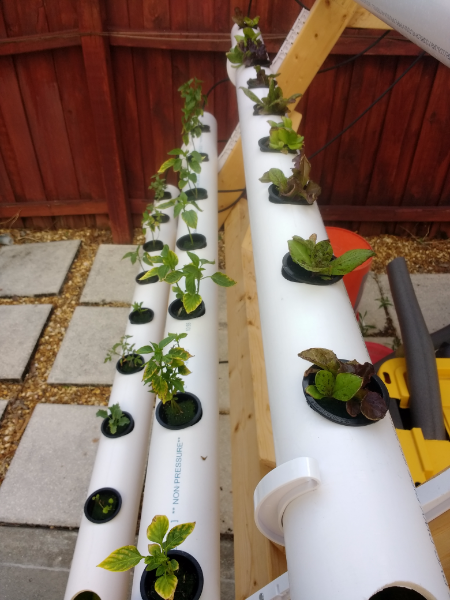 Also, keeping pipes completely full will hopefully lessen the algae growth in the system. It is better to have fill pipes or completely empty without flowing water. These were $12 for a 6-pack. They do not have any functional purpose yet they look pretty in the night. Win in my book. It dawned on me that I hadn’t thought about nutrition yet. 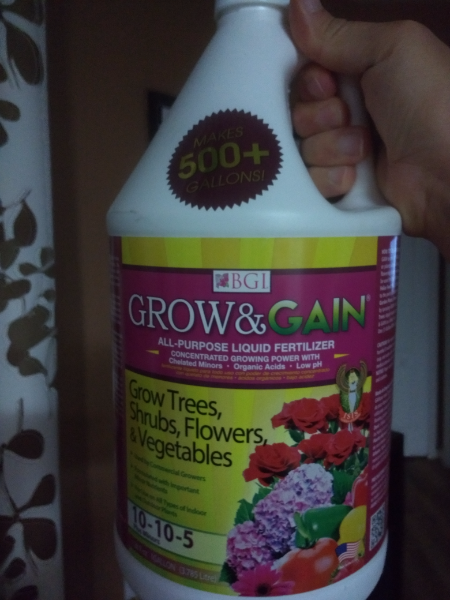 On the next trip to the garden store, I got one of these. I am doing about 90% dosage thinking that it is best to be cautious than go overboard. This is something I will be doing much fine tuning as time goes by. For the near future, I have these ‘Chiltepe’ peppers on the way. They are supposedly very difficult to sprout (in Florida at anyways) but I will give them time. They are very tasty. Did I mention that a month and change ago the temperature was in the low 30s? Well, fast forward to April and we are suffering from drought conditions, brush fires and 100 degree afternoons in good old Florida. This is a very unhappy tomato. 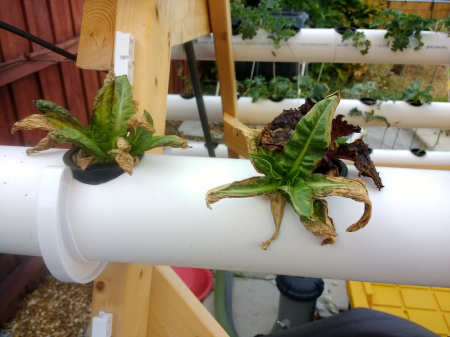 My lettuce is also taking a hit. 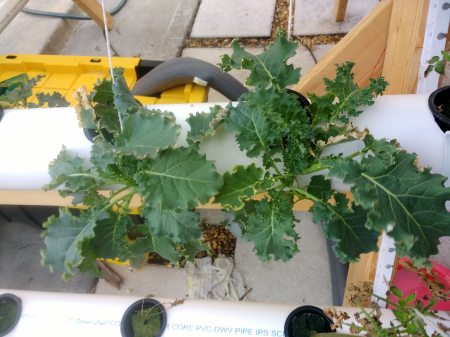 Other plants, like kale, are doing a bit better. 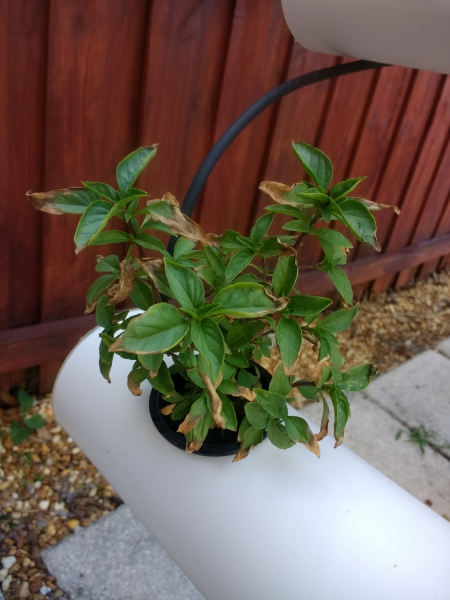 I would say that about half of the plants look ok and the other half have leaves wilting. 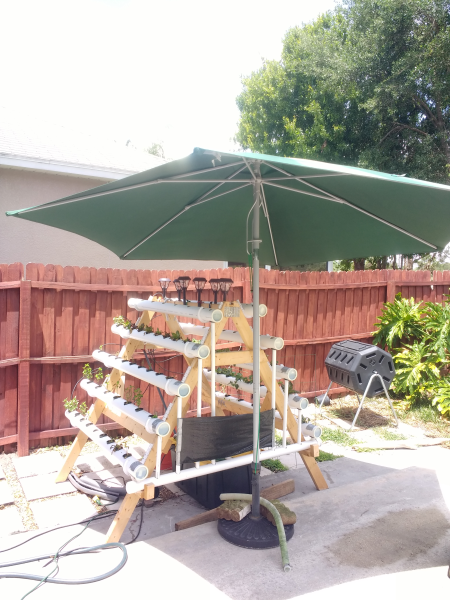 I read up on the amount of direct sunlight for the vegetables I am attempting to harvest and times vary between 4 to 6 hours a day. Generally, these vegetables are under direct sunlight for more than 6 hours every day. I wish I knew more how to ‘read’ the plants to be able to foresee where the system is going. Hopefully, the constant flow of water helps keeps the plants reasonably comfortable. Time will tell. Thanks for reading. 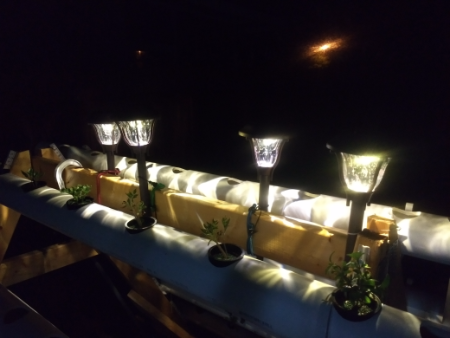 This entry was posted in hydroponics and tagged backyard hydroponics. Bookmark the permalink.